The term empire derives from the Latin imperium (power, authority). An imperial political structure is established and maintained in two ways: (i) as a territorial empire of direct conquest and control with force, and (ii) as a coercive, hegemonic empire of indirect conquest and control with power. Former FBI Director Louis Freeh released his report on the Penn State abuse scandal this week and answered many lingering questions. But those answers just seem to conjure up more questions. How did this happen? How was it allowed to continue? How did so many people in positions of power shirk moral responsibility? And for what? At what price? What could have changed the course of these events? In short, a woman. Had there been a woman in a position of authority as the allegations against Jerry Sandusky surfaced, we could have written a different ending to this story. Lives could have been altered. A woman would have put protecting children over preserving legacies. A woman never would have walked away from a child being victimized by Jerry Sandusky in a locker room shower. When university officials didn’t take proper action, a woman would have taken it upon herself to get authorities involved. Sadly, there is no hero in this story. Male or female. Where do we go from here? Many decisions will be made in the coming months, starting with the people who willingly turned their backs on innocent children. The future of the football program is in question. Some are calling on the NCAA to shut down Penn State football for a year while they sort through the fallout from this tragedy. What about the current players? They are also innocent victims and don’t deserve to have their futures tainted by a past they had nothing to do with. Chicago Tribune writer David Haugh suggests players should be allowed to transfer out of Penn State without penalty. I agree. We now know the truth. The next step is obvious. The final step in the dismantling of any empire is the removal of the statue of the once beloved leader. It shouldn’t be ceremonious and celebratory like Saddam Hussein’s ultimate dethroning. 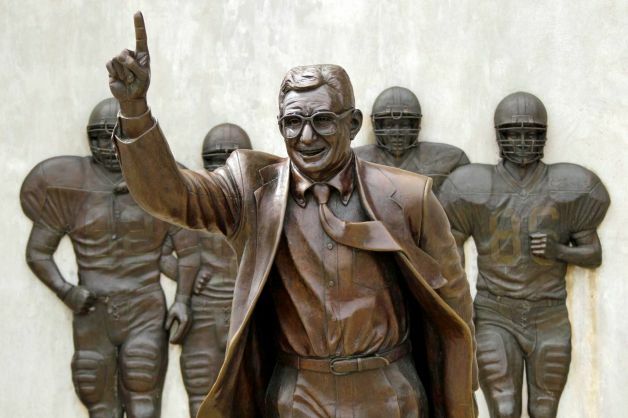 More appropriately, Joe Paterno’s likeness should be removed in the middle of the night. Under a cover of darkness. And a veil of secrecy. Much like the crimes committed and the ongoing coverup that sustained them. And in its place…nothing. Just a broken slab of concrete, like the broken lives that remain. And a plaque that reads: Never again. This entry was posted in NCAA, Penn State and tagged Joe Paterno. Heather Lloyd is a former news anchor who graduated from The Newhouse School of Public Communications at Syracuse University and now spends her time writing about her true love...football. The author of two blogs: Pigskin 'N Pearls and The Blue Mare, Heather lives in Indianapolis with her husband, two stepchildren, and pampered pooch. A die-hard NFL, Colts, and college football fan, Ms. Lloyd has been known to blow off barbecues, baby showers, and birthday parties to watch sports. And she isn’t sorry. The saddened truth about this story is it is too late for some, but hopefully this will help to open up some well needed eyes. Great writing Heather! The one thing that has struck me most powerfully as I watched this story unfold was how many opportunities there were for someone to change the course of events–yet no one did. How many people noticed something that didn’t look quite right? How many people saw any one sign? So many years, so many boys, so many opportunities to do the right thing. I’m sick and disgusted–and more conscious of my own surroundings. Thanks, Heather. I agree. If anything good comes out of this, it should be lessons for the future. Will hopefully make parents more aware, as well as those in positions of authority. But you’re right…so, so many red flags. One hero could have made a big difference. Thanks for reading…and commenting, Tammy! On love, loss, and homecomings. Peyton's coming home. And I am a mess.